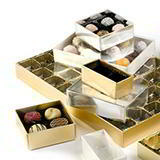 These Christmas themed chocolate boxes come in various designs, printed and prepared for the perfect presentation of chocolate and other sweet treats. 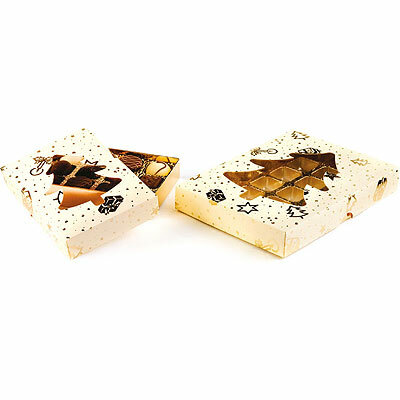 Foil printed with trees and presents images these Christmas chocolate boxes are sold complete with the lids, inner tray and base, saving you the hassle of having to source or purchase them separately. 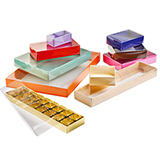 Sold in packs of 25, the Christmas themed window lids offer a sneak preview of the inner contents, while the trays acts as a sturdy presentable divider. Check out our all year round star wraps - also sold complete set with the wraps, lids and base, and are available in a choice of elegant colours - bronze and antique gold.